Is Sen. Antonio Trillanes leaving PH for good? 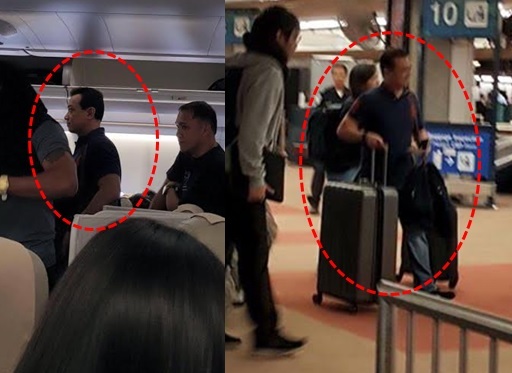 MANILA, Philippines- Photos of Sen. Antonio Trillanes IV at the airport has been making rounds on social media after Davao Breaking News shared it on its Facebook page. Sen. Antonio Trillanes spotted leaving the country. Shall he return? While some believe that Trillanes, just like other candidates, is simply taking a break from the recently concluded national elections, other netizens can’t help but speculate that Trillanes is leaving the country for good. Trillanes, who conceded his defeat in the 2016 vice-president race, filed plunder charges against presumptive president Rodrigo Duterte a week prior to the elections. The lawmaker accused the outspoken mayor of Davao City of having questionable bank accounts at the Bank of the Philippine Islands (BPI) and not declaring over P200 million in his Statement of Assets, Liabilities and Net worth (SALN). Despite the heated exchange of words between their camps, Trillanes acknowledged that the people have chosen Duterte as the country’s next leader. “I assure the Mayor and our countrymen that I will not be a hindrance to the reform initiatives he intends to push in our government,” he told Manila Bulletin in a text message. As of this writing, Trillanes’ camp has not issued a statement regarding the viral photos. On Wednesday, May 18, Duterte said Trillanes could have committed treason after having secret “back-channel” meetings with Chinese officials over the West Philippine sea dispute pointing out that someone should be held responsible for the loss of Scarborough Shoal to the Chinese. “Trillanes went (to China) there 16 times. After the 16th visit, we have lost the Scarborough Shoal,” Duterte said. “To me, it’s treason. Somebody has to answer for that, it means livelihood for the Philippines, for the Filipinos, our fishermen will be deprived,” he added. Charges of treason and espionage were earlier filed by PDP-Laban partymates of Duterte against President Aquino and Trillanes for conducting “back-channel talks” with China.